Puddletown School is an AMI Montessori school, including three primary classrooms and two elementary classrooms for children ages 3 to 12. We are dedicated to providing a loving, nurturing environment to aid in the self­ development of the whole child. Half and full day schedules are available, as well as early care and aftercare. What are the advantages of mixed age classes? Having different ages in the classroom brings with it a wide range of benefits. Cooperation and tutoring between age groups increase achievement and self­esteem in both older and younger children. Students are able to reinforce their skills and knowledge as they learn from each other, building confidence and responsibility. Older children learn leadership skills and empathy by engaging with the younger children, and younger children learn from the older children’s example, creating excitement for the future. There is an added advantage in that students and teachers (guides) can enjoy the experience of being together for more than one year. How do teachers (guides) deal with discipline? Conflicts arise naturally out of interactions between different people. We teach conflict resolution throughout the year to give children ways of solving problems themselves. In this way, children are given tools for dealing with conflicts before they happen. This helps avoid discipline problems that come from not knowing how to work through arguments peacefully. We give children the skills to create a balance between freedom and responsibilities that teach them to respect themselves, others, the classroom, and the materials. With these skills, children begin the lifelong process of learning to respect others’ opinions and to search for solutions to conflicts. What is the student/teacher ratio in the primary classroom? The student/teacher ratio is 10 to 1. Our walking field trips maintain a ratio of 6 to 1. Class size is designed to be large enough to foster independence, but small enough to allow for appropriate guidance and supervision. Do students have too much freedom? Children choose their own work within guidelines set by the teacher. This framework offers a great deal of freedom, but each freedom has a corresponding responsibility. No. A healthy lunch should be sent with the child daily. We encourage parents to involve the child in the process of shopping, preparing, and packing a healthy meal void of sugary food. All containers should be easily opened and closed by the child. For primary children, Puddletown provides snacks that are available throughout the day. Elementary students bring their own snack packed with lunch, including an aftercare snack if needed. It is a good idea to check in with your child about lunch and ask if they are getting too much or not enough food. The Montessori method is named for Dr. Maria Montessori, who devoted her life to the observation and study of children. 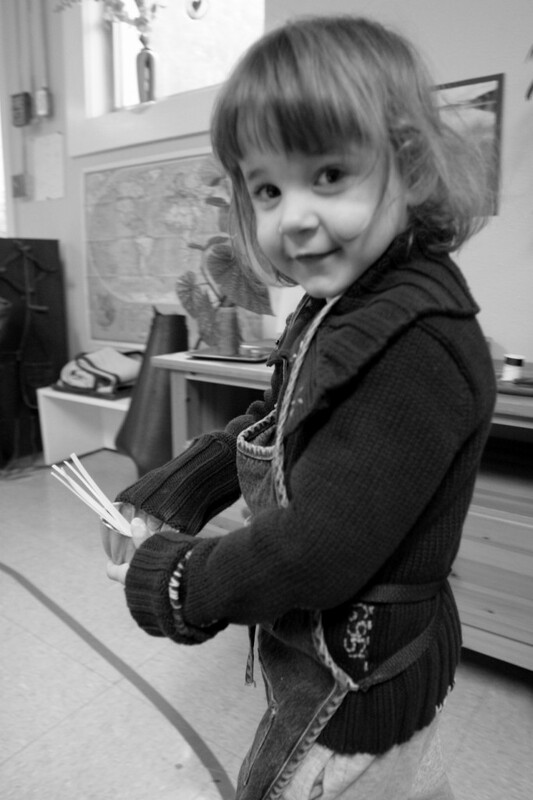 Montessori is a comprehensive approach to education from birth to adulthood. Beginning her work over a century ago, Dr. Montessori developed her approach through the observation of children from many cultures and economic backgrounds. It succeeds because it draws its principles from the natural development of the child. The inherent flexibility of the method allows it to be adapted to the needs of the individual, regardless of ability, learning style or social maturity. Dr. Montessori believed the needs, talents, gifts, and special individuality of each child were important as a developmental guide. Using this approach she created “prepared environments” for multi­age groups (0-­3, 3-­6, 6­-9, 9­-12, and 12-­14). The environments contain specifically designed materials for development that invite children to engage in learning activities of their own choice. Under the guidance of a trained teacher (guide), children in a Montessori classroom learn by making discoveries with the materials, cultivating concentration, motivation, self­ discipline, and a love of learning. Montessori is a hands ­on approach to learning that encompasses the use of the five senses, kinetic movement, spatial refinement, and small and large motor skill coordination. With this concrete knowledge, children find their own way to an understanding of concepts. This is combined with a deep love and need for purposeful work. The Montessori method emphasizes self­ reliance and independence in the classroom and at home by teaching children the skills to do as much for themselves as they are capable of. The trained teacher (guide) is an artful organizer of experiences for the child to discover, process and practice. Constant and ongoing observation by the guide is one of the foundations of the Montessori program. Most educators and psychologists today agree that the single most important period in the development of a person’s intelligence is between birth and age five. A child’s mind is extremely absorbent and curiosity is at a peak during these early years. When properly nourished and stimulated, the child’s mind forms patterns for learning that serve them well throughout life. The primary classroom is a child­-sized world. By careful selection of materials, the classroom allows the child a place to explore life on a level they can understand. The materials or exercises are designed to stimulate independent explorations. The environment entices the child to proceed at their own pace from simple activities to more complex ones. Through this process, the child’s natural curiosity is satisfied and they begin to experience the joy in discovering the world around them. The elementary classroom is designed to nurture imagination and reason. The materials are carefully selected and encourage collaborative work. There are many resources available for research and independent study. Children are encouraged to follow their interests and take initiative to go out into the community to learn more. The elementary classrooms are inviting and designed to nurture imagination and reason. There are large tables and open areas for children to work collaboratively on big group projects. They are filled with materials such as musical instruments, bones, maps, charts and art supplies that aid in the child’s spontaneous exploration and research of many subjects. The classroom stimulates discovery and deep thinking. The elementary classrooms have a pet that the children learn to feed and care for. Primary children come into the school, greet the guides, wash their hands, hang up their coats, and begin their day. They move about the classroom from activity to activity, using a small rug for work on the floor or sitting at a table. They may be talking or working with a friend, choosing to work alone, or sitting back to observe if they wish. During the course of the day each child chooses materials of interest, may receives lessons from the guide on a new material, shares snack with a friend, etc. Throughout the morning the children may gather to hear a story read aloud, share news, sing songs, recite poems, or work on group projects. Part of each day is spent outside. At the end of the morning the children help set up lunch and everyone in the classroom eats together. Elementary children start the day by greeting the adults and children in the classroom. They spend time writing in their journal and planning the day, being sure to vary the subjects and experiences each day and follow up on unfinished projects. Large and small group lessons as well as individual lessons are taking place through out the morning. The elementary classroom is lively and social and busy. Each day children eat lunch and spend some time playing outside. They have a read aloud time and a time to have snack. Weekly elementary children have PE, a meeting with their teacher, and circle of friends (a democratic conflict resolution meeting). What is the role of the teacher (guide)? Guides encourage, redirect, and supervise as the child learns through their own personal motivation. They plan the environment in the interests of the children, and help children progress from one activity to the next. The guides track each child’s development to create a lesson plan that meet each child’s needs. We use the word “guide” in Montessori since the children teach each other and themselves and the adult is there to guide them towards their best selves. Why do you recommend a five-day experience? A child who attends school for five consecutive days each week will have a greater opportunity for smooth, spontaneous learning. A child taken in and out of school frequently does not have the same opportunity and consistency to pursue their unfolding interests. In addition, our AMI certification requires that all children attend 5 days. In the primary classroom children interact continuously, sometimes choosing to work on projects together, and older children often help younger ones. Children also eat snack and lunch in groups. Each day there are group activities and outside play. As children get older, and naturally more social, the work provided is more group oriented. In the elementary classroom there is constant socialization and group work. Children ages 6-12 are natural collaborators and the classroom and curriculum is designed to meet that need.